An Adventure In Space And Time review . Science fiction. History. These were the alternating currents at the birth of Doctor Who . One week the TARDIS would hurl us to the impossible worlds of Skaro or Vortis. A week later the narrative voltage would reverse and we would be in Ancient Rome or the summer palace of Kublai Khan, enrolled in the show’s mission to inform and educate as much as thrill and terrify. Fandom found a name for this type of story: the Hartnell historical. Now here’s the ultimate Hartnell historical. Brought to the screen with a retro fetishist’s attention to detail, An Adventure In Space And Time conjures the early 1960s with all the care Doctor Who once expended on recreating imperial Cathay or sixteenth century France. This is a lost Britain of fog and milky streetlamps, beehives and Woodbines, rotary telephones and fat Bakelite televisions. The BBC is “a sea of tweed and fag smoke”, creating magic on pin money budgets while the first satellites circle above, the future tremblingly close, as close as Telstar 2. It’s a world as distant, as alien, to today’s kids as the temple of the Aztecs must have seemed to child viewers in 1964. Mark Gatiss’ script is a fistful of love letters: to the spirit of the BBC, to the fallen kingdom of Television Centre, to the clever, risk-taking outsiders who gave us Doctor Who , to that quiet British bravery that insists the best defence against bad news is to say “I’ll make us a nice cup of tea.” It takes familiar facts and anecdotes – the scrape of key on piano wire that became the uncanny howl of the TARDIS, Sydney Newman’s immortally earthy description of Verity Lambert as all “piss and vinegar” – and stitches them into drama, giving a human face to the holy writ of fandom. Did we ever realise just how young Verity Lambert was? Here she is, the first producer of Doctor Who , dancing at a party, chic, pretty, preposterously young, the girl who gave herself a year to “get on in television or get out.” Gossip and condescension trail her down corridors. People stare and whisper in her wake. “That’s all it is, Waris. Front. Inside I’m shaking like a leaf.” Jessica Raine captures Lambert’s career-making mix of sensitivity and boldness, the uncertainty behind that front – and the reserves of steel and fire behind that uncertainty. Just watch her passion as she argues for the inclusion of the Daleks, challenging the very man who believed in her. Brian Cox and Sacha Dhawan impress as fellow Who pioneers Sydney Newman and Waris Hussein but ultimately this is William Hartnell’s story, and it belongs to David Bradley. He finds the sweetheart behind the sod and we watch as Doctor Who ignites something wonderful in this prickly, pugnacious man. It’s a lovely scene as Hartnell explains the show to his granddaughter, the old bugger thawing with its magic, and an equally resonant moment as she rationalises one of his line flubs with a kid’s imaginative logic. There’s a ton of soul in Bradley’s performance, so frightened as he doubts his own powers as the illness takes hold, so wounded as he learns of the decision to replace him. Only now do you realise just how bruising this recasting must have been – the human cost of the behind-the-scenes lore so dryly enshrined in your copy of The Making Of Doctor Who . Director Terry McDonough brings us a luminous fairytale ‘60s. There’s nothing charcoal-drab about this Britain, no sense of the party waiting to begin. The only hint of monochrome is found in the images on the studio monitors, a sly nod to the smoky, flickering visions of time and space experienced by the viewers at home. Everything else is a Technicolor dream of history, bigger and shinier than we ever imagined, from the gleaming blue and silver Daleks patrolling Skaro to the meticulous recreation of the original TARDIS set in all its futurist glory, the “white heat” of Harold Wilson’s technological revolution made real. McDonough’s greatest flourish is, ironically, his darkest: the Daleks are introduced with ominous drums and tight, tantalising close-ups of weaponry. Only at the last moment do we realise we’re looking at the gun that will slay JFK. Yes, there are inaccuracies, omissions, elisions. Hartnell’s notoriously intolerant side is acknowledged but defused with a twinkle and a gag (“I’ve been offered A Passage To India ,” says Hussein. “One way?” teases Hartnell). There are key players who don’t make the screen. Gatiss pre-empts this criticism by having one of his characters say “So many people were at the birth of this thing we’d be here all day.” Inevitably things are telescoped, tidied. 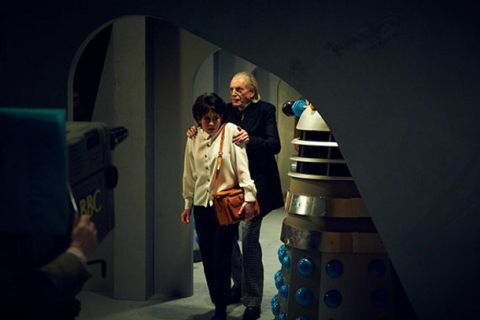 The moment Hartnell steps onto the TARDIS set for the final time and confronts his own undreamt future is the moment this drama finally escapes the gravity of accuracy, breaks free of history. Or maybe it’s the moment it truly becomes Doctor Who , joining those alternating currents of fact and fantasy, past and future, history and science fiction, and welding them into a magical, triumphant whole. Read more of our TV reviews.